If Tangata Whenua, the fantastic illustrated history of Māori from Pacific origins to modern day, is the coffee table book every Kiwi family should own, The First Migration is the truncated desk reference for the office. Both are published by Bridget Williams Books and The First Migration, by acclaimed archaeological researcher Professor Atholl Anderson, draws heavily on the first two chapters of Tangata Whenua, which Anderson wrote with Judith Binney and Aroha Harris. What we get here is a matter of fact and brisk summary of the scientific evidence and oral histories and traditionals that give clues to the population of the Pacific and ultimately the migration to Aotearoa, which the best evidence suggests happened sometime in the late thirteenth to late fourteenth centuries. If you are looking for a dramatic retelling of long distance canoe trips and tribal battles in the islands, this isn’t the book for you. The First Migration distills the work of numerous experts covering archaeology, genetics, radio carbon dating, wind and current patterns, canoe technology, language and analysis of whakapapa lineage and oral traditions to trace the spread of humanity through the Pacific. What is striking is the extent to which we can retrace the steps of the Pacific’s inhabitants using a mix of modern science and study of traditional and oral and written histories. In Europe and Asia, central America and South America, archaeologists and historians can draw on ruins and records etched into stone or parchment. Not so in the Pacific. Here it involves more painstaking detective work. The First Migration reveals the remarkable knowledge that has been assembled in the quest to flesh out the story of Pacific migration all the way to our own shores. 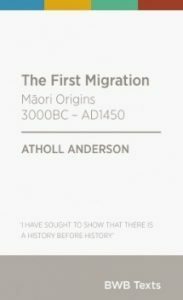 As such it is a handy reference that will quickly get you up to speed on the history of early migration to our part of the world.